The Islamic State [IS] group has released photographs that allegedly show the final moments before a man is thrown from the roof of a building in the Iraqi city of Mosul as punishment for being gay. The photos were uploaded to Justpaste.it by jihadists and circulated on social media sites by IS-affiliated accounts. 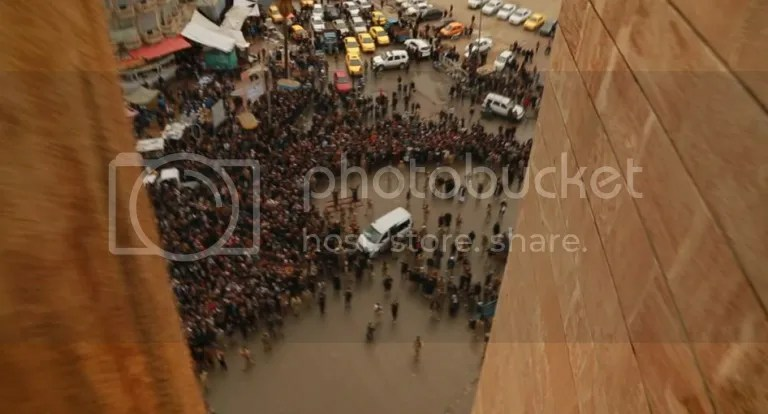 The photo shows a man about to be pushed to his death by two IS militants and another shows that a large crowd had gathered to watch below. As the large crowd (Muslims) gathered below to watch the brutal execution, there does not appear, at least openly, to be any opposition to the judgment meted out by ISIS against the homosexual. Below is a YouTube video of protestors in the Palm Springs, CA that gathered back in 2008 to protest the unanimous approval of Prop-8 initiative. Proposition 8 was a ballot initiative, and a California state constitutional amendment, passed in the November 2008 elections, which says that "only marriage between a man and a woman is valid or recognized in California." The video is from a local news report covering the protest that took place at the Palm Springs City Hall. Wonder if the protestors in the video would have been as vocal in the Iraqi city of Mosul as they are against the Christian grand-mother in the USA? YouTube Note: Public Advocate of the US has been sending volunteers all over the United States conducting a Citizens Survey to find out if Americans support traditional marriage and the Marriage Protection Amendment, legally defining marriage as between a man and a woman at the Federal level. An overwhelming majority said that they do and wanted to encourage President-elect Obama to do the same. (7:80) And remember when We sent Lot, as a Messenger to his people and he said to them: Do you realize you practice an indecency of which no other people in the world were guilty of before you? (7:81) You approach men lustfully in place of women. You are a people who exceed all bounds. (7:82) Their only answer was: ‘Banish them from your town. They are a people who pretend to be pure. Rom 1:27 and in like manner also the males having left the natural use of the female, did burn in their longing toward one another; males with males working shame, and the recompense of their error that was fit, in themselves receiving. I have selected one of the many references from the Quran, the Old and New Testaments (Holy Bible), that condemns the act of homosexuality as being an egregious sin. Having established such, it seems a little disingenuous that the ant-Christian / pro-homosexual movement, in America, would be so vocal against Christianity while turning a mute tongue to Islam… or does it. Hundreds of students of varying religions gathered outside of the chapel on Duke University’s campus Friday, , to take part in an Islamic call to prayer — in support of the school’s Muslim population, which had been offered then denied the opportunity to broadcast the call from the chapel’s bell tower. The adhan was heard over a small amplifier on Friday, but Duke had announced Tuesday that the three minute chant would resonate from the chapel’s bell tower each Friday before the Duke Muslim Students Association met for their weekly prayers in the chapel’s basement, as they have been doing for years. Muslim leaders from across America will gather in Texas this weekend to hold the annual Stand With the Prophet in Honor and Respect conference, a weekend forum that is being billed as a “movement to defend Prophet Muhammad, his person, and his message,” according to event information. The Saturday event, which seeks to combat “Islamophobes in America” who have turned the Islamic Prophet Muhammad “into an object of hate,” according to organizers, comes just a week after radicalized Islamists in France killed 17 people. Evangelist Franklin Graham was particularly opposed to the call the prayer idea, taking to Twitter and Facebook to discourage alumni and donors from supporting the school until Duke reversed their decision. While Islam is being promoted as a ‘religion of peace’ across the west, in the shadow of this past weeks rampage, the homosexual community’s silence is deafening. When Sharia Islamic Law comes to America, it will be interesting to see how the two ‘spirits’ get along.